Sift flour, cornstarch, baking powder and salt into a large bowl, then whisk it just a few times, set aside. In the bowl of an electric stand mixer, on medium speed, whip together butter, shortening and sugar until very pale and fluffy, about 4 minutes, scrapping down the sides of the bowl as needed. Add in egg and mix until combine, then add egg white, vanilla and almond extract and mix until combine. With mixer running, slowly add in dry ingredients and mix just until combine. Transfer dough to an airtight container and refrigerate 2 hours. Preheat oven to 375 during the last 10 minutes of refrigeration. Scoop dough out a scant 1/4 cup at a time and roll into a ball. Place dough ball on a lightly floured surface, sprinkle top lightly with flour, then using something flat and smooth (such as the storage container lid), press and evenly flatten dough to 1/2″ thick (so you should have about a 2 2/3″ – 2 3/4 ” circular cookie). Transfer flattened dough to a Silpat or buttered cookie sheet and repeat process with remaining dough (you’ll have to use 2 cookie sheets). Bake in preheated oven 9 – 11 minutes. Allow to cool 5 minutes on baking sheet before transferring to a wire rack to cool. 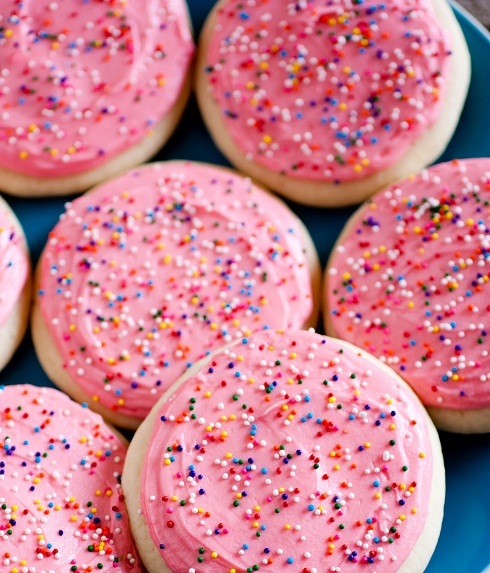 Cool completely then frost with Vanilla Frosting (note that frosting begins to set quickly so if you are adding sprinkles, sprinkle each cookie immediately after frosting it, don’t frost the whole batch of cookies then try to sprinkle them because the sprinkles wont stick). Combine all ingredients in a large mixing bowl, using an electric hand mixer, whip until frosting is smooth and fluffy. Mix in food coloring if desired (note: I finally figured out how to get a good pink with your average grocery store food coloring, I put like 8-10 drops red and the faintest amount of blue – be careful if you do this though, it’s no where near a full drop. Basically you’d want to touch it to your clean finger and then swipe it in. Random tip but thought I’d share, I never like the hot pink hue I used to get. The tiny bit of blue just tones and cools it down a bit). It’s also fun to color coordinate and frost and sprinkle these cookie according to the nearest holiday. These cookies rock! Made them this morning and they’re already gone. Thanks for the recipe. The instructions were very clear and thorough.